Caring for and using your cooking equipment properly will help it last longer and will make you a be a better cook. Avoid these 10 no-nos to keep your kitchenware in tip-top condition, and to maximize its performance. Even if the manufacturer says it's dishwasher safe, don't throw your cutlery in the dishwasher. The abrasive cleanser and powerful spray can dull the blade. What's more, you risk cutting yourself when you reach into the rack of the dishwasher to unload it. The chemical coating on your nonstick pans and bakeware is easy to damage. Using a wire whisk, a fork, a metal spatula or a knife can scrape or chip the finish. Instead, use wooden spoons, whisks coated with silicone or plastic, and silicone or plastic spatulas. Whether you bought it pre-seasoned or have built up a seasoned patina over the years, the coating that gives cast-iron cookware nonstick properties can be damaged if not cared for properly. 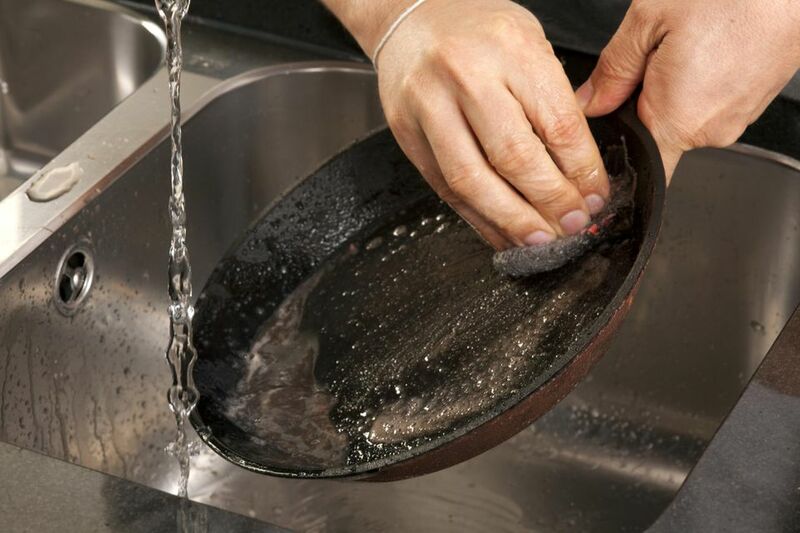 The number-one way to strip your cookware of its seasoning is by scrubbing it with harsh detergents or scratchy scrubbers. Instead, just rinse it right after cooking with hot water and dry it with a dishtowel or a paper towel. For stubborn, stuck-on food, scrub with coarse sea salt or use a nonmetal brush. As with washing knives in a dishwasher, storing them improperly, like kicking around loosely in a drawer, can be bad for both you and the knife. It's far too easy to accidentally cut your hand while reaching into a knife-filled drawer, and a good knife rack will better protect sharp blades. Wood will warp and swell if it's submerged in water for too long, and the glue holding a cutting board together can loosen. Don't let tools sit in a sink for too long; instead, wash them quickly and let them dry on a drying rack in a warm place. While many recipes call for spraying a pan with cooking spray to further keep food from sticking, a chemical in most of the sprays called lecithin can build up on the pan's interior, creating discoloration and a gummy coating. If you need a little more lubrication, just use a small amount of butter or olive oil (and if you like the spraying action, invest in a mister that you can fill with your own oil). Always use nonstick pans over medium heat or lower – any higher can damage the nonstick filling and some people believe it can also cause potentially toxic chemicals to be released. Respect those fill lines or the guidelines in the instruction manual about the maximum amount you can put in the jar of a blender or the bowl of a food processor. If you overfill, the appliance might not be able to evenly process your ingredients, and you also risk messy leaks spills. If you have a larger amount of food than the recommended amount, divide the food in half and work in batches. When using uncoated stainless steel pans, heat them on their own or with a drizzle of cooking oil on the burner for a couple of minutes before adding meat or vegetables. The act of heating the pan will open the pan's "pores", allow the oil to create a smooth, stick-resistant surface that will nicely brown food without it sticking to the pan's surface. The food should sizzle when you add it to the pan. When sautéing, trying to put too much food in the pan can cause it to steam, rather than brown, so the texture won't be as crisp and you might not achieve that caramelized, browned flavor. Use a large enough pan for what you're cooking, or work in batches if not everything fits comfortably. Not Reading the Instruction Manual. Above all, read the information that came with your kitchenware. It will give you valuable information on the best way to use and care for your equipment. What's more, you're likely to learn about tips, features, and functions. Keep all of your instruction manuals in a folder so that you can easily find them if you need to refer to them. If you lose your manual, many manufacturers have them available online, and you might be able to find them from other, third-party websites.